SuperEnalotto is an Italian lottery established in the 1950s that has turned quite a few people into multimillionaires over the years. In fact, the prizes won by the biggest SuperEnalotto winners in history are among the largest in the world, and SuperEnalotto holds the record for having the biggest payout of any of Europe’s domestic lotteries. Only EuroMillions, Europe’s multinational lottery, topped it in terms of payout. The largest prize ever given away among the biggest SuperEnalotto winners was €177.7 million! That being said, SuperEnalotto also has the lowest odds of winning compared to all of the other lotteries in the world. Considering how many countries and lotteries there are out there, this says quite a lot about how tough this game is! The exact odds of bagging its jackpot are 1 in 622,614,630, and only a few individuals have been lucky enough to nab the jackpot prize, taking home millions of euros along the way. Even though most of the jackpot winners decided to stay anonymous, let’s take a look at the 10 biggest SuperEnalotto winners and how much their winnings were. On October 30, 2010, a ticket held by a syndicate of 70 players in Milan, Lombardy, took home a total of €177,729,043. 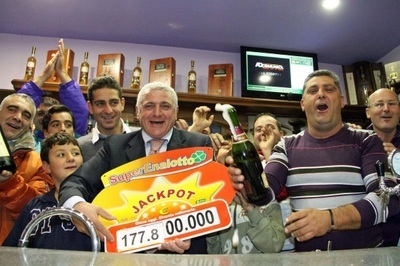 The amount was the biggest jackpot in SuperEnalotto history. A syndicate consists of lotto enthusiasts who pool their money in order to buy more lottery tickets and increase their chances of scoring the jackpot. Any winnings acquired by the group would be distributed equally among its members. The share of each syndicate member from the biggest jackpot recorded in SuperEnalotto was €8,885,000. The identities of the 70 syndicate members who won the largest SuperEnalotto jackpot remains a mystery. The SuperEnalotto website claimed that although the lucky ticket was bought in Milan, the winners were from 38 cities and towns across Italy. We’re no detectives, but it’s entirely possible that the winning ticket was purchased on behalf of these players by one of our favourite online lotto agents. The draw held on October 27, 2016, produced the largest individual winner in SuperEnalotto's history. The winner of the €163,538,706 lottery jackpot chose to remain anonymous, so the official website of SuperEnalotto only revealed the winner to be a man from Vibo Valentina, Calabria. What the man did with his winnings was not known. According to news sources, Domenico Lo Bianco, a Catanian newsagent operator, was phoned by reporters just after the draw. They told him that the winning ticket was sold by his store. At first, he dismissed the call as a prank, but he confirmed the story later when he rushed to his store only to find it hounded by journalists. Bianco said that the winner never contacted him, and it was impossible for him to guess the identity of the winner because he has so many customers. The newsagent owner just hoped that the winner would remember the huge fortune that his shop brought him. He also hoped that the money had been awarded to someone who really needed it. The second biggest single winner of SuperEnalotto was determined in the August 22, 2009, draw. The unnamed winner of the €147,807,299 jackpot came from Bagnone, Tuscany. The amount was the biggest payout to a lone winner between 2009 and 2016. The personal details of the winner have been withheld from the public, so nothing is known about how he or she spent the money. The jackpot worth €139,022,315 was given away to two people on February 9, 2010. The winning tickets were sold in Parma, Emilia-Romagna, and Pistoia, Tuscany. Each winner took home €69,511,157.50. No further information was provided about the identity of the lucky individuals who took home the big prize. 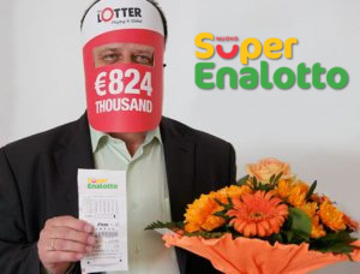 The third biggest SuperEnalotto prize handed to a single winner was €130,195,242. The draw that produced an instant multimillionaire from Caltanissetta, Sicily, was held on April 17, 2018. Like many other SuperEnalotto winners, the winner also chose to remain anonymous after bagging the jackpot. The six winning numbers that produced a single winner were drawn on October 23, 2018. The anonymous winner of the €100,756,197 jackpot came from Catania, Sicily. The draw on May 19, 2012, made one person €94,836,378 richer. This SuperEnalotto jackpot winner's identity was kept secret as well. The SuperEnalotto website only revealed the person to be from Catania, Sicily, again—the place must be a lucky charm to lottery players! The lone winner of the €93,720,843 SuperEnalotto jackpot was determined on February 25, 2017. The anonymous winner bought the winning lottery ticket in Mestrino, Veneto. A single SuperEnalotto ticket won the jackpot worth €35,947,847 on the August 1, 2017 draw. The unnamed winner was from Caorle, Veneto. The last jackpot in our top 10 biggest SuperEnalotto winners list was worth a whopping €71,162,850 and given to the single winner of the draw held on December 27, 2010. The anonymous winner hailed from Naples, Campania. According to the SuperEnalotto website, the winners of the lottery can either reveal their identities to the public or remain anonymous. The majority of the SuperEnalotto winners choose the latter because they want to avoid unwanted attention from both the members of their communities and the prying eyes of the media. Others choose to go public about their win because doing so would save them from the hassle of concealing their status to the people close to them. Winners can also choose to go partially public by using their alias instead of revealing their real names. Compared to many lotteries worldwide, SuperEnalotto has no cap on its jackpot, meaning the jackpot prize continuously grows whenever no winner has been determined by a draw. Therefore, there's a chance for it to surpass the current €177.7 million record in the future. Furthermore, winners can choose to remain anonymous to protect their privacy. This would really help avoid unwanted attention and keep people with dubious intentions out. Lastly, SuperEnalotto is easy to play. Just pick six numbers from 1 to 90. You can even join a syndicate in order to improve your chances of winning. The odds of winning the SuperEnalotto may be very low, but if you happen to take home the jackpot prize, will that even matter? If you feel like taking a chance on this game, think of six lucky numbers and buy a SuperEnalotto ticket online. You never know—you could become millions of euros richer sooner than you think!